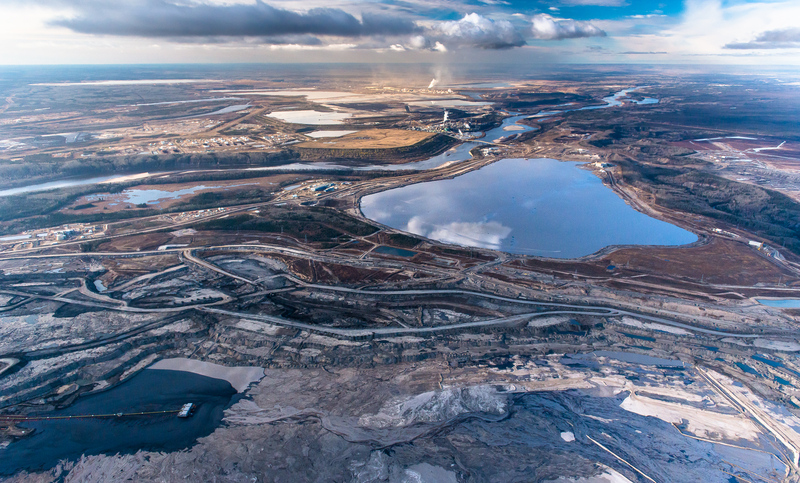 Suncor and Syncrude Upgraders, mines, tailings ponds, and Athabasca River. Alberta Oil/Tar Sands, Northern Alberta, Canada. The Athabasca River winds between massive mines, tailings ponds, and upgraders. The deposits of bitumen are nearest the surface in areas close to the Athabasca River. As a result, much of the most intensive and toxic development occurs on either side of the river. Toxins leach and gather in the river and are transported downstream to indigenous communites as well as into the Peace Athabasca Delta, the world's largest fresh water delta and the only one occuring at the crossroads of all four of North America's migratory flyways.